In the early 1800’s, entrepreneurs were exporting sheep wool from Peru to the British textile mills. The importers in Portsmouth became fascinated with the incredible material used to make the sacks for shipping the wool. They found the source to be alpacas high in the Andes. Since the South Americans used most of the alpaca fiber, the little that was allowed for Europe was highly treasured and started a high-end fabric industry still growing today. Alpacas have been domesticated for several thousand years, originating from the Vicunas that still are wild in the Patagonia. Surviving on some of the worst forage in the world, alpacas were a kind of domesticated “South American Buffalo”. They were used for meat (dried alpaca meat may be the source of the word “jerky”), and the fiber. The mummies of the ancient royalty were wrapped in alpaca fiber of a fineness rarely matched today. When the Spaniards conquered the Patagonia, subjugating the natives was achieved partially by killing their alpacas. The alpacas that escaped went in the mountains, and were considered extinct by the outside world until the British found the sacks. As recently as this last century, Peruvian terrorist bands would punish uncooperative villages by slaughtering their alpacas. For now, alpacas have experienced resurgence in Peru, Bolivia, and Chile, and have been exported to thriving colonies in Australia, Canada, and the United States. Alpacas are shorn once a year for their extraordinary fleece. They are gregarious herd animals, known for their gentleness, alertness, and curiosity. 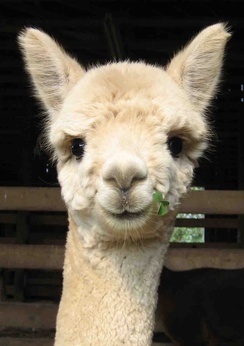 Alpacas have one offspring, known as a “cria”, per year. Alpacas do not have mates, and breeding only occurs when the female (dam) is receptive to an available male. Gestation is nearly a year and females may stay pregnant most of their lives. Relatively defenseless, alpacas can only run from a predator. The alpaca’s one nasty habit, the infamous “spitting”, is uncommon and is usually directed at another alpaca. Unwary humans may get caught in the crossfire but experience teaches alpaca ranchers to know when to stay clear. An alpaca’s overall “cuteness”, however, is its’ most infectious quality. BIO: Rhonda and Kern Deschner are experienced alpaca ranchers raising alpacas through all kinds of Texas weather since 1997. 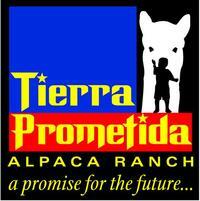 Tierra Prometida Alpaca Ranch, found on FM32 near the Devils Backbone rest stop, can be visited by calling Rhonda at 512-753-9962, or at tierra@alpacausa.com. 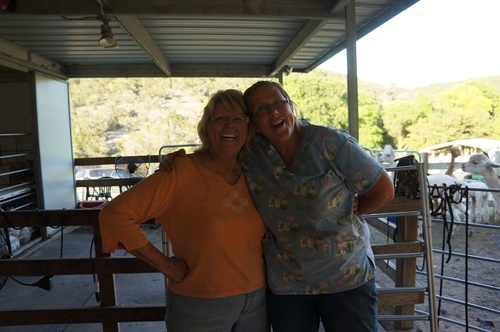 March 24th was a beautiful day at the ranch for our open house! Rhonda said to be sure and send her thanks to the many visitors and new friends that braved the hillside road and were rewarded with a perfect day with the alpacas. The alpacas were in a good mood and full fleece. Rhonda’s incredible trophy haul from all the championships at the Houston Livestock Show decorated the barn, and our son kept the pastures, and therefore everyone’s shoes, clean. There wasn’t even any “spit”! My father always said “In Texas, you never complain about too much work or too much rain” but we were close to complaining when it rained the next week, almost right up to shearing day. Wet fleeces don’t store very well. As it turned out, we had nothing to worry about. The skies cleared and the shearing madness went on for two days. Now the alpacas are all “stick figures” again, and are much cooler. We have dozens of bags of fleece to play with now. The day after our open house, CBS Sunday Morning ran a piece showcasing two alpaca farms. Both of these farms’ sole income is from alpaca herds that are far smaller than ours. The question asked during that show, and one asked of us frequently, is “can you make a living doing this?”. I think the answer is “it depends”. It has been my observation that the farms that thrive by exclusively raising alpacas are the ones that commit completely to the idea. They start with a good business plan, obtain the best quality alpacas they can afford, and go through a transition period of building their business before becoming full time alpaca ranchers. These ranchers make use of all aspects of the alpaca from selling their offspring, producing and selling fiber products, and even selling the compost! With good business practices, many farms are already making a living with alpacas. Of course, alpaca ranchers will say that one of the biggest benefits is the lifestyle of being able to work with beautiful, peaceful, cooperative alpacas all day! For those who do not want to go “all in”, alpacas make a great side business that can keep up an agricultural property tax exemption and provide side income. All one needs is a little land, water, shade, predator protection, a love for animals, and a trustworthy alpaca breeder to get you started. First of all, thanks to all those who visited the ranch over the holiday break! The weather was great and the babies friendly. If you missed your chance, we still have lots of friendly alpacas that are camera hams. Just let us know ahead of time so we can be sure to have a guide available. By the time this goes to print, we will have completed the alpaca seminar on February 2-3rd. Three world class alpaca judges agreed to come to our ranch to educate a group of select breeders about techniques to refine breedings and maximize the quality of the offspring. This is now possible due to the creation of an Expected Progeny Differences (EPD) Registry for the alpaca world. Such EPD’s have existed for cattle, horses, and other livestock for a long time. A cattle breeder, for example, can consult the computer registry looking for a breeding steer that has a history of bringing certain characteristics to offspring such as rate of growth, fat percentage, and even disease resistance. Even “ease of birthing” is measured, which is important for the rancher that can’t always be available for a calf delivery. That was what our seminar was about. 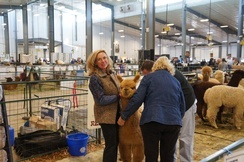 Short of a national meeting sponsored by an alpaca organization, I am unaware of any other farm that has brought these three superb celebrity judges together in one place to provide such an important seminar for local breeders. I supposed that was why we had attendees from as far away as Oregon! Cooling Down Heats Things Up! For three months, it’s been too hot for alpacas to want to have a baby (cria) or even to breed. When cooler weather arrives, they become much more interested in being active, including breeding! Since cooler weather is the best time for birthing, and alpaca pregnancies conveniently last a year, we will soon be starting to have our fall crop of cria, a very cute time! 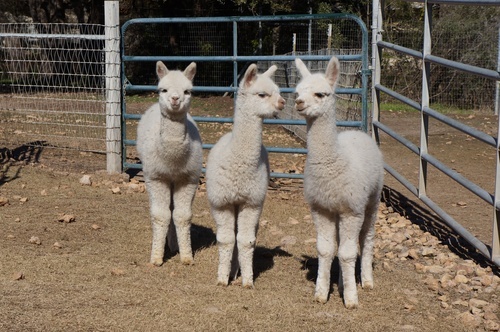 Alpacas mom’s (dams) are re-bred within a month of delivery so we will also soon be starting the breeding season. We have to make decisions about which male (sire) we should use for a particular dam including outside sires whose genetics we may want to bring into our herd. We are always trying to “breed up”. We want breedings that will increase the fleece amount and quality. Sometimes that decision is based on past breedings; if the last one worked our really well, it may be one we want to repeat. Some of our best sires are co-owned with other farms so we have to be sure our best sires will be available on our farm when we need them. Fortunately our partners live up north, and don’t breed their herd in the winter, so they are happy to send the sire here. There are certain breedings that are best avoided. For example, twenty five percent of breedings between a black alpaca with a white spot and a grey alpaca result in a blue-eyed white offspring that is deaf. The fleece may be fine in the offspring, but the genetic problems take the cria out of the future breeding program. Breeding choices have too often been a “best guess” . Babies are always cute, so you may not know for a couple of years how good of a choice you made back then. Hooray for science! The Alpaca Registry is developing a catalogue of EPD’s, or Expected Progeny Differences. Basically, it is a statistical index created by the Registry that takes into account the good and the no-so-good characteristics that a particular sire or dam has a proven to “throw” into a breeding, and how likely that will occur in future offspring. So, instead of making our best guess, we have data to help us make a rational decision. The EPD’s are still being developed but our ranch has been an active early participant in the program, and the results have been a show-winning upgrade in the cria. So, now they are even cuter, even longer! I felt that! As a physician, those are words I hope not to hear when treating a patient. However, those words take on a much more positive implication when they apply to working with alpaca fiber. I have written about alpaca yarn, fabric, and even rugs, but have not yet mentioned one of the easiest and most artistic ways to work with alpaca fiber: felting! 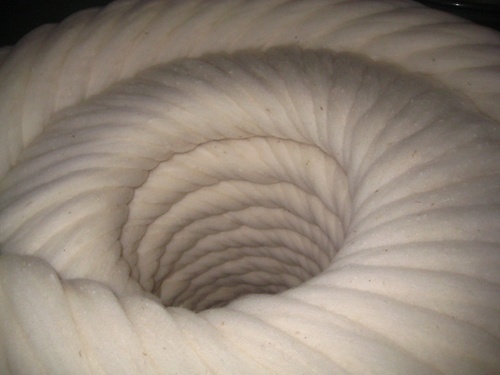 Felting is the process of intentionally tangling the fiber to form a solid mat. There is “wet felting” usually done by hand by agitating the fiber in hot soapy water, then manually laying it out in a mat to dry. The other method, “dry felting”, uses barbed needles passed repeatedly through a blanket of fleece to inter-lock the individual fibers. Dry felting is less messy and involves no chemicals but it is labor intensive . . . unless you have a machine to do the work for you. Dry felting produces a more consistent roll of felt. There no need for the fleece to be spun, woven, or knitted so felt is easier to produce. It can be cut into all kinds of shapes, and is the primary fabric type used for some specific items, like western style hats. We just took a vacation in northern Germany. We came across shops that had a fantastic array of all kinds of things made out of felt, ideas that I would never have considered. There were handbags, artwork, slippers, placemats, toys, key chains, table coasters . . . and more! Judging from what they were charging for these items, I can see where felting would have a significant profit margin, if one already owned the fleeces and a felting loom. Plus, felting looks like an outlet for artistic creativity even if you don’t have a clue about how to knit. I have to confess there is some danger in me writing this article. My wife might see it! We have the fleeces, but she really wants to invest in a dry felting loom. It makes felting almost idiot-proof, which means that I would probably be the one assigned to do the felting on our ranch. Right now, I have college tuition to pay for, so the loom may need to wait awhile, but felting on an industrial scale looks like an easy way to turn fleece into cash without paying middle men. To quote my wife’s painfully bad pun, “Felt may be looming in our future”! Today, instead of talking about Tierra Prometida Alpaca Ranch, I want to tell you a little about the people who brought us the alpaca...the people who have been caring for them and arranging their lives around these amazing animals for centuries: the Quechua people. The Quechua speaking people were the "Incan Empire". With the conquest by Pizarro and the decimation of the population by Small Pox, the Inca retreated into the mountains- the altiplano of the Andes. It was here where they were able to save the vestigial population of alpacas that the conquerors had not killed. These animals were their livelihood-providing food and fleece for clothing. This has not changed much over the past 400 years. In the altiplano of the Andes, many of the descendants of these people still speak Quechua. They still depend on alpacas for their livelihood. They continue to be a shadow of the civilization that they once were. These are the people who have persevered to bring us the alpaca as we now know it. The Quechua Benefit is an organization that is dedicated to helping the Quechua people- some of the poorest of the poor in Peru. 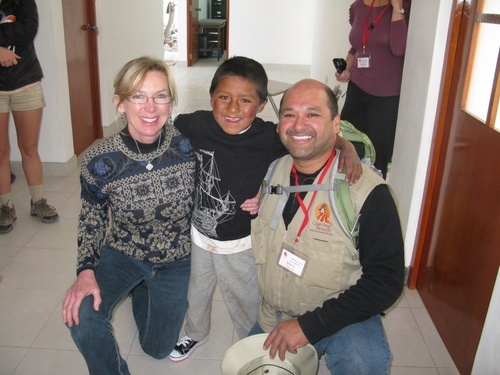 Rhonda has had the privilege to be on the board of directors and has been able to participate in their medical missions over the past 4 years. This November, she is on her way back. The Benefit is gradually building a school, chapel, and medical clinic for these largely ignored and desperately impoverished people and staffing it with those who love alpacas and the Quechua. It is not an easy task: the altitude is extreme, around 15,000 feet, farming is hard, rain scarce, and roads treacherous. On the other hand, items common to us (sunscreen, shoes, eyeglasses, etc.) are so precious to them that it only takes a little to make a big impact. The Quechua Benefit. Has recently opened a children's village that we have named Casa Chapi. The concept is to have a self- sustaining village that provides housing, education, and a chapel with green houses and a nurturing home environment for the children. Many of these children are orphaned or have been abandoned because their families can't take care of them. The first 20 children, aged 4 years to 9 years moved in the summer of 2012. There are now 36 children living at Casa Chapi. For more information or to make a donation, please go to. www.quechuabenefit.org. So...lets work together and turn this world around! Raising alpacas and using their fiber continues to be a growing industry in the United States although the growth has been slowed by the economy, pretty much like everything else. Unlike many other livestock industries that have completely collapsed, the alpaca industry continues its gradual growth because of the intrinsic value of alpacas as livestock and of their fleeces. One good side of these economic times is that alpacas have become much more affordable and buyers can be choosy. Alpacas are generally easy to raise. Most owners had little, if any, experience with livestock before starting their herd. Alpacas will generally integrate well with other livestock, including goats, donkeys, and horses. Some breeds of domestic dogs are very suitable for alpaca, although a dog that gets inspired to “hunt” may get cornered by the herd, which could end up badly for the dog. Alpaca ranchers appreciate the intelligent and inquisitive nature of alpacas as well as their modest consumption of hay and feed. Their padded feet do not dislodge the fragile Hill Country soil, and the lack of upper teeth means they do not destroy the roots of native grasses. Owners also appreciate their tendency to have babies (cria) at convenient daylight hours, probably a survival throwback to the thousands of years of having cria in the Andes where it is best to be born at a warm time of day. The mothers (dams) have one cria per year and our Texas heat makes winter crias a better idea. Indeed, the Texas heat is a special consideration with alpacas as they are Andean animals. Alpacas do thrive in Central Texas with protection from predators, provision of forage, water, and shade, and with timely early shearing to keep the fleece short in the summer months. Alpacas do not need much space, which is perfect for people with small acreage. They do tend to use one spot in the pasture as a community toilet, which is convenient for pasture clean up. Of course, they will choose where that particular spot is, and sometimes it’s not where the humans want it to be. Come the next spring, that spot is the greenest place in the pasture. Alpacas are gregarious herd animals whose greatest stress is being isolated from other alpacas, even by just a fence. They always need an alpaca “friend”. More on that with the next installment. Around April 1, we sheared nearly 1/3 of a ton of alpaca fleece, and that is no April fool’s joke! Each of the fleeces were placed individually in plastic bags and put in a barn store room to be sorted later. Through May and June, we were off on the road to alpaca shows. Now, however, comes the time to chase the snakes and scorpions out of the store room, and settle down to figure out how each fleece will be used. The easiest choice is picking the fleeces that will go to competition, setting those aside for this winter. We knew these fleeces when we saw them coming off of the alpacas. After they are judged this winter, they too will be turned in the products. Now is the best time for the weavers and spinners to come around and look at all the available fleeces to use in their work. The San Antonio society is currently working on a day to look over the fleeces. Probably a third of the fleeces will be used this way. About 20% of the fiber comes from the legs and the belly. This is courser fiber than in the “blanket” of the alpaca (the blanket is the finest part of the alpaca’s fleece, across their backs, upper thighs, and base of their neck). While belly and leg fiber is still soft, colorful, and durable, it is not soft enough to be used in clothing. It is fantastic for making rugs! 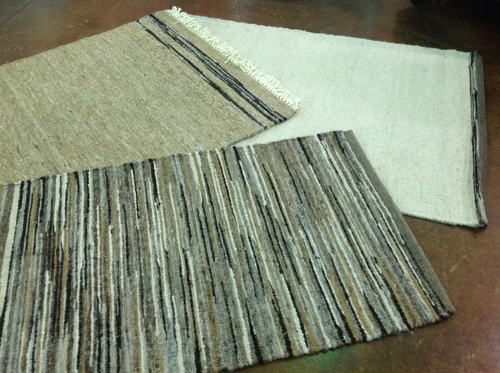 We have made large rugs and wall hangings, medium-sized rugs and floor mats, and even place mats for the table. I personally think this is one of the best deals going. 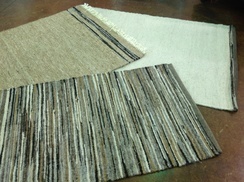 These rugs are beautiful, and they are a fraction of the cost of similar products for sale in Austin! I wish my cats didn’t find them so irresistible for rolling and purring, and for claw sharpening! The rest of the “blankets”, this year, are going to the Pendleton Wool Mill’s Alpaca Blanket Project in Oregon. The name is a double entendre; alpaca “blankets” to create human blankets! This particular mill is world famous for their work with fine fibers. They are determined to use the finest alpaca blankets they can select, to create unexcelled blankets for people. Their goal is to make the best in the world. We are proud that all our retired show fleeces, and most of the rest, have been selected to go to this project, which demands the cleanest, highest grade fleeces obtainable. The results are going to be great! Later this year, we hope to participate in exciting new way to process our yarn. We are working to become involved and part ownership of a new, and expensive, automatic felting machine! If this works out, expect an article on it this fall! It’s Show Time, so It’s On The Road Again! When I was a kid growing up in Corpus, everything was far away. It was a big deal to drive to Houston. El Paso might as well have been on the moon. Little did I know that my perception was reversed . . . the world is not a long way from Corpus as much as Corpus is a long way from the world! Now, Corpus fans, don’t get upset about that . . . I love CC and part of me will always think of it as home . . . but we didn’t get out much. Since we started raising alpacas, the USA has shrunk. 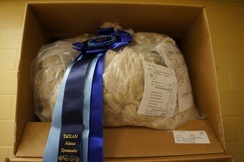 It is not a requirement to travel if one owns alpacas, but it is if you want to show them in national contests. Most of our alpacas stay home, but the chosen few alpacas have to endure the show season. That means being led into an arena where the judge feel around all over your body, which must be embarrassing. Then, they look at your teeth, pull out a few hairs for comparison, and you have to stand there and behave. The good part, for the alpacas, are the other alpacas. Apparently all alpacas know one another because they are immediately glad to see all the others. We already have completed the “local” shows (Fort Worth, Houston) and, by June, we will have been to Grand Island NE, Denver, and Louisville KY dragging a trailer full of alpacas both ways. With apologies to long-haul truckers who have to do this all the time, there is a certain romance in being “on the road” pulling a trailer. In gas stations from coast to coast (also in the MGM Grand parking lot), people wander over to the trailer and ask “what are THOSE?”. The road can be a fun place. Besides, Arkansas has great road signs like “Used Cows for Sale”, “Tattoos While You Wait”, and “Road May Be Wet When Raining”. Not kidding. We feel shows are important. First, there is networking with people from all over the USA who love alpacas. Second, the shows are THE place to verify your breeding program with wins, or to find out you have work to do with losses. Shows are truly a benchmark. We have waited breathlessly as the judge, at last, announces our alpaca as the champion. We have also kicked the dirt in frustration when we got the “walk of shame” and had our alpaca “excused” from the show ring. Money hangs in the balance . . . having a champion male at a national show will make the phone ring. 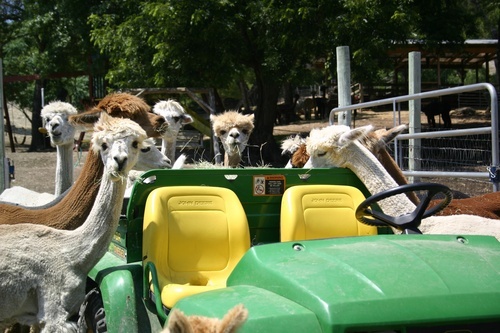 Summer has arrived at Tierra Prometida Alpaca Ranch. The shows are over, the trailer is parked, and the show materials stored. The alpaca cria (babies) are born, shearing is done, and it’s getting too hot for even the stud males to be interested in breeding. In the cool of the mornings, and twilight, the alpacas wander around the pastures while the cria stretch their legs with group races. During the days, the trees make great shade. We have had some rain so there is grass to sleep on. This is the time of the year when no-one puts you in a trailer and hauls you across the country to go into a show ring. It is a time to eat, sleep, grow fleece, and nurture the cria. It is three months of summer vacation for the alpacas. Things slow down for the people, too, although not as much. The main summer task is to make sure the alpacas can stay reasonably cool by having access to shade and water. By “reasonably cool”, we have to keep in mind they handle the heat better than I do! I get to sleep in the AC at night, while they will sometimes be content sunbathing in the full mid-day brightness. Mostly, we have to watch them regularly to see any changes in behavior that may indicate heat stress. 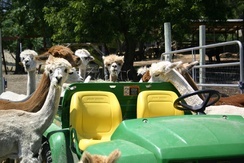 Looking at the alpacas every day trains the eye to know if one is ill.
Summer can be a battle against bugs and weeds. Animals that produce manure will attract flies and we have tried just about everything to control the swarms. It seems like one of the most effective weapons we have found . . . are chickens! They eat just about every bug they can find and apparently bring havoc to fly larvae. They are pretty good about keeping small snakes away as well. The other summer chore is to zealously kill grass burrs, the”landmines of the back yard”, the destroyers of fleeces. Alpacas rolling in grass burrs, also known as “stickers”, will ruin this years fleece beyond recovery. Because the alpacas graze off the ground, we have been very hesitant to use herbicides. Instead, we will attack a sticker plant on sight, surgically dig it out to avoid dropping a burr, and dispose of it almost like hazardous waste. It has taken years to get the burrs out of the pastures, but the effort shows in the quality of the fleeces.